Chrysal is now introducing a new and improved flower food in two different designs. 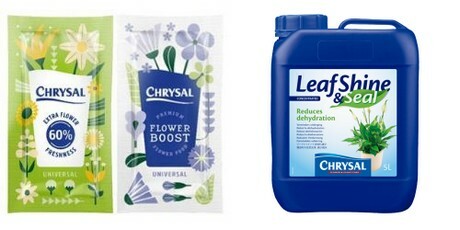 Chrysal Better Bloom is developed especially for florists, it gives your floral designs the boost it needs. With all the needed nutrients to keep your amazing floral designs fresher and more beautiful. Chrysal Supreme is developed for supermarkets and bouquet makers and ensures customers can enjoy the flowers up to 60% longer. The new improved formulation Chrysal LeafShine & Seal will also be presented during the IPM. Developed to reduce transpiration of plants during the transport and store phase, resulting in healthier looking plants and more attractive sales displays. As its name suggests, LeafShine & Seal also, when applied to foliage plants such as monstera, provides an instant, natural sheen removing dust, mildew and hard water stains. When combined with Chrysal Aqua Pad which provides a natural reservoir for water, plants look and far outperform untreated plants. Visit the Chrysal stand at 1D12.28 on January 22 – 25 where they will discuss in more detail how their new flower food as well other products in our range of flower and plant care can help you add value to your business.